You are in: Home > Articles > Eye Gaze – say it with your eyes! Eye gaze or eye tracking is a way of accessing your computer or communication aid using a mouse that you control with your eyes. The Tobii systems follow your eyes with amazing accuracy to see where you are looking on the screen. You can then select the item you are looking at by dwelling (staring at the screen for a length of time), blinking or clicking with a switch. Tobii eye gaze systems work by having lights and cameras that are constantly sending and receiving information. The camera picks up light reflections from your pupils and translates the movement of your eyes into mouse cursor movements. It takes only seconds to complete a one time calibration. Anyone who may find accessing a computer or communication aid difficult using standard or other access methods. With one of the largest track boxes on the market, the Tobii systems can track over 95% of users, regardless of eye colour, glasses, contact lenses, lighting conditions or head movements. It is used by people with conditions such as Motor Neurone Disease (ALS), Cerebral Palsy, Muscular Dystrophy, spinal injuries, Rett Syndrome and people with profound or multiple disabilities. 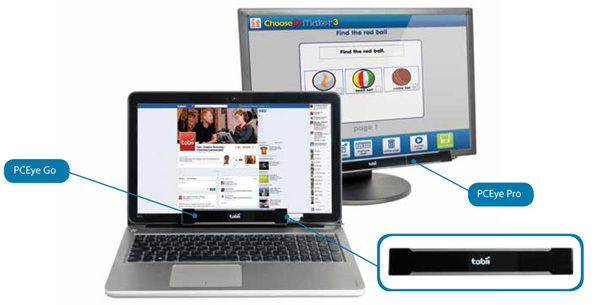 Communicate - using eye enabled software such as Tobii Communicator 4 and The Grid 2. Such software offers a wide range of symbol and text based vocabularies. The eye gaze is configured to snap to buttons on grids, making eye gaze easy to use. 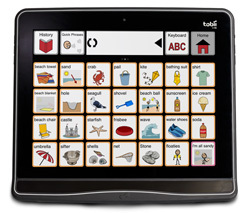 The Tobii I-12 and I-15 with Eye Gaze Interaction offer powerful, portable, individual communication solutions that also include environmental control, Bluetooth and Internet capabilities. Assess, play and learn - anything you would normally use a mouse to access, you can access with your eyes, and that is almost all software! Looking around the screen will move the mouse cursor accordingly, stare at a point on the screen or blink to click. Tobii’s Windows control options allow you to right/left click, double click, drag and magnify to accurately select small targets, opening up a whole range of software opportunities. Such freedom enables eye gaze students the opportunity to use the same software as classmates, play their favourite games and even access their favourite websites. For those on their first steps with eye gaze, Inclusive Eye Gaze, Sensory Eye-FX and Look to Learn software have been specially created to provide progressive, fun, easy to play activities to get you started. To make and play your very own choice making activities, games and quizzes, check out the NEW ChooseIt! Maker 3 – it is now eye gaze optimised, making it even easier to play and learn with your eyes. The PCEye Go and Pro can make most personal computers accessible with your eyes, making them a very flexible solution that could be used on a number of different computers and with a variety of people - a great inclusive tool for schools and colleges.